Unlike a majority of people in power, Kerala’s finance minister, Dr T.M. Thomas Isaac, does not wear any attitude on his sleeves. At the end of his day at the secretariat in Thiruvananthapuram, he prefers to casually join a group of employees leaving the office to his parked car at the entrance instead of hopping into a beacon-fitted car. The minister’s Facebook page ­appears as grounded. Like a journal written in earnest, his posts in social media are about his everyday ordinary encounters with people. Isaac’s joined Facebook in 2011, during the election campaign. Towards the end of 2012, he used it effectively to highlight his efforts to clean up his constituency through his campaign called ‘Clean Home, Clean City’ on social media. His posts made people take ­notice in no time. With the gradual rise in the number of his followers, he went on to become one of the most popular politicians on social media in Kerala. Isaac has also used Facebook efficiently during the various agitations and struggles he has participated in. “When the unorganised salesgirls of a textile shop went on strike, it was not reported by the mainstream media. I got involved and shared their struggles on FB. When the owners refused to budge from their stand, I called for a boycott of the shop. Finally, they ­relented,” says Isaac. Another struggle was highlighted after coir workers were dismissed in large numbers in the state in 2015. As the president of the coir workers union, Isaac led the protest march from Vaikom to Thiruvananthapuram. 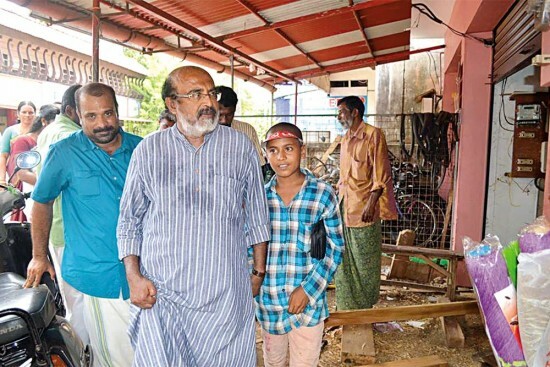 During the agitation in front of the secretariat, Isaac ­befriended a young peanut seller named K. Arun Kumar, who also happened to be an engineering student. The 20-year-old was pitching in to help his father, who is an auto-rickshaw driver. Isaac’s post went viral and was reported widely by the mainstream media. Such insightful posts, highlighting the travails of the common man, have kept increasing the number of his followers on social media.